Yet Menino kept his composure, flawlessly moving through his talking points with the deftness of, well, a career politician. Barring some last minute bombshell of a scandal from the current administration, Flaherty still has a slimmer chance of winning than he does of magically turning into a dragon and claiming the mayor’s office by fire. To overcome this disadvantage, Flaherty had to first convince voters to dump Menino before he could ask them to consider him. It’s the same strategy all challengers must use against incumbents, but in this race, given Menino’s deep entrenchment, the calls for change had to be omnipresent. To his credit, Flaherty did just that. For months, he and Sam Yoon campaigned heavily on a message of change, at times seemingly campaigning only on that point. Despite his efforts, though, he still trails Menino 52 percent to 32 percent according to a poll published Sunday by the Boston Globe. While it’s an improvement for Flaherty from May poll results that pegged the gap at 61 percent to 23 percent, it’s still not nearly enough for him to hope to unseat the mayor. So why is Flaherty still so low in the polls and, by all appearances, headed toward a trouncing in November? 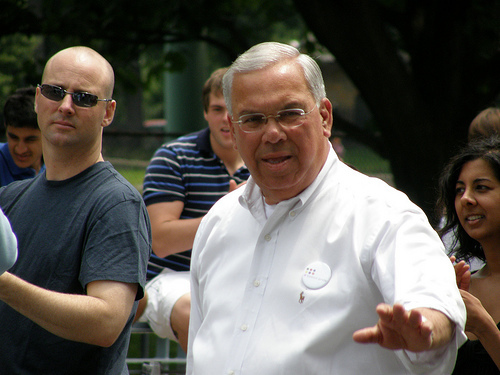 To unseat such a popular and well-established politician as Menino, a challenger needs infinite pathos to connect to voters and make them believe in the changes he is proposing. Otherwise, voters, more or less content with the current state of affairs, aren’t going to buy whatever some challenger, whose name they may have never heard before, is trying to sell them. This was evident from the first question of last night’s debate. When asked how voters should judge their hypothetical stewardship of the city, Menino gave an oblique answer about the importance of schools and strong city finances. Clichéd, sure (children are or future and I believe in them) but ultimately something most voters agree with. Flaherty’s response: performance evaluations. Regardless of whether or not this is a good idea, it doesn’t resonate with voters. It is a technocratic answer and, when compounded by Flaherty’s flat delivery, makes him sound like the most dreaded of political characters, the bureaucrat. Especially in uncertain times, people are hesitant to embrace change. They are more likely to go with the leadership they know than the leadership they don’t—and if the candidate they don’t know speaks primarily in fractions and acronyms, you can bet they won’t even listen to him. It’s the same pitfall that befell Al Gore who, no matter how practical his policies were, spent too much time explaining their incomprehensible intricacies, prompting criticism and even ridicule of his personality. As much as it’s a shame, most voters do not want to hear the minutiae of initiatives. Candidates must therefore condense their policies into teensy talking points (Schools good! Taxes bad!) or risk losing their audience’s attention altogether and being perceived as dull, dull, dull. Watching the debate, it was easy to see Menino connects with his audience. He knows what people want and he speaks it plain and simple; unlike the prototypical politician, he sounds human. When asked to evaluate his management of Boston’s schools, Menino was, as always, unpolished and blunt. With a slight shrug and an expression of “I’m just ballparking it here,” the mayor gave himself a B+. Now that’s pathos, and that’s why he’s poised to win another term.